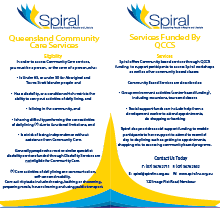 Spiral offers community based services through QCCS (Queensland Community Care Services) funding to support participants to access Spiral workshops as well as other community based classes. As well as developing core skills, these services provide opportunities to build and enable community connections and social inclusion. QCCS funded supports include social support, centre-based and in-house services, which generally have a contribution fee of $20. Costs vary for those participating in workshops under centre-based services. Read more about Spiral workshops and costs. For other centre-based services, please contact Spiral. Core activities of daily living are communication, self-care and mobility. Core activity tasks include dressing, bathing or showering, preparing meals, house cleaning and using public transport. If you are unable to download this form, please contact Spiral for assistance. Our QCCS brochure (PDF 143KB) is available for download. If you would like to make an enquiry about services, please contact Spiral.